We solve the Euler equations for a compressible gas. We also need to compute volume fractions for the initial condition. We make boundary conditions free outflow. Initial conditions come from Toro’s book (Riemann Solvers and Numerical Methods for Fluid Dynamics, 3rd Edition, Springer Ed.) Chapter 17 section 17.1.1 are given in terms of density (ρ), pression (p), velocity (u) both at the left and right side of the discontinuity placed at R=0.4. To define an accurate (i.e. symmetrical) initial sphere of rayon R, we compute the volume fraction corresponding to the spherical interface. Left and right initial states for ρ, w and energy E=ρu2/2+p/(γ−1). 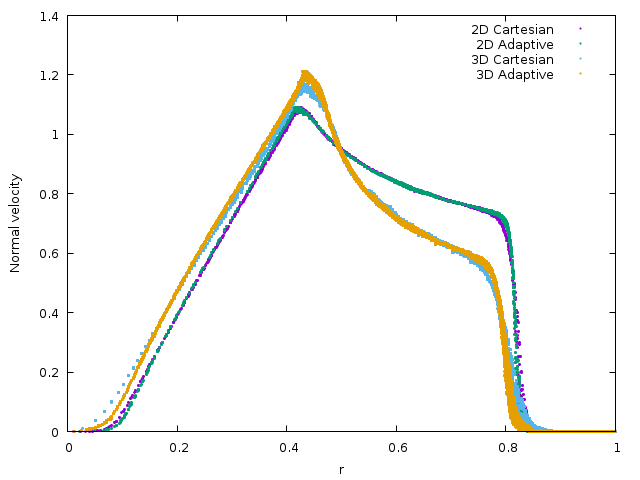 At t=0.25 we output the values of ρ and the normal velocity un as functions of the radial coordinate. For reference we also output a cross-section at y=0. On trees, we adapt the mesh by controlling the error on the density field. 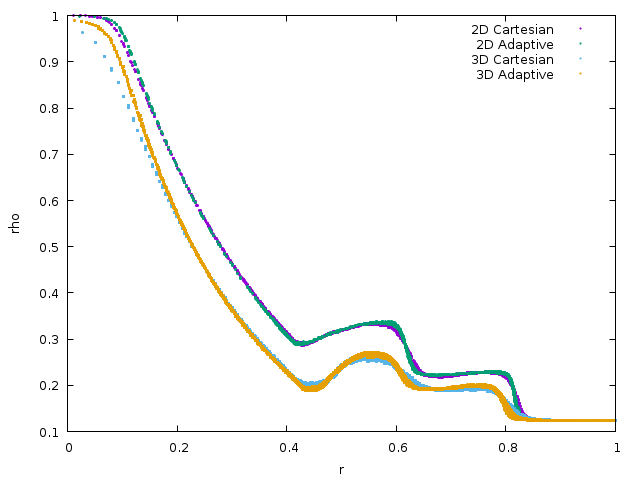 Results are presented in terms of ρ and normal velocity un for Cartesian (7 levels in 2D and 6 levels in 3D) and adaptive (8 levels in 2D and 7 levels in 3D) computations. The numerical results compare very well with Toro’s numerical experiments.